Moral Theory sets out the basic system used to solve moral problems, the system that consequentialists deride as 'traditional morality'. The central concepts, principles and distinctions of traditional morality are explained and defended: rights; justice; the good; virtue; the intention/foresight distinction; the acts/omissions distinction; and, centrally, the fundamental value of human life. 1 Ethics, Knowledge and Action. 2 Basic Concepts in Moral Theory I. 3 Basic Concepts in Moral Theory II. Good, Evil and the Will. Criticisms of PDE and Replies. 4 Close-Up on the Good of Life. 4.1 Life as a Good. 4.2 The Right to Life and the Sanctity of Life. 4.3 The Sanctity of Life and its Critics:. A Life Not Worth Living?. 4.4 Persons and Human Beings. "Oderberg's discussion of [the] issues is rich and thought provoking. 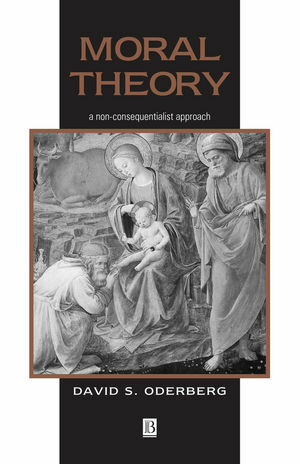 [The] work is, even for non-believers, an important and engaging statement of non-consequentialist moral theory" Kaspar Lippert-Rasmussen, The Philosophical Quarterly, vol. 51, no. 204, July 2001. Presents a controversial non-consequentialist view of ethics that will provoke lively debate among liberal moral philosophers such as Peter Singer and his proponents. Explains the leading ideas of traditional morality in a straightforward way. Equips the reader with the theorietical groundwork necessary to apply traditional morality to modern-day controversies.